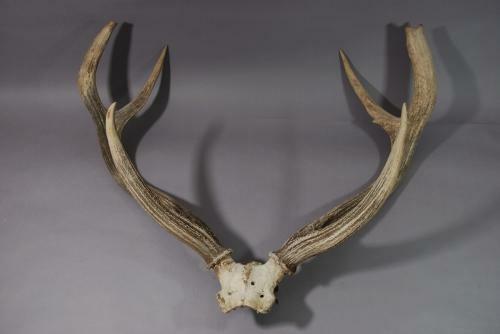 A large late 19thc pair of sculptural stag antlers, possibly from a red deer. These are trophy antlers probably hung above a door at some time, from a large country house. Although not on a mount at present, this could be done by the purchaser, if required. These have a great 'shabby chic' look about them, as they have spent some time outside. Antlers can be found in many places at present as are very fashionable, but these are a period piece rather than buying something brand new.